Cleansing Conditioner for Fine Hair is rated 3.7 out of 5 by 59. 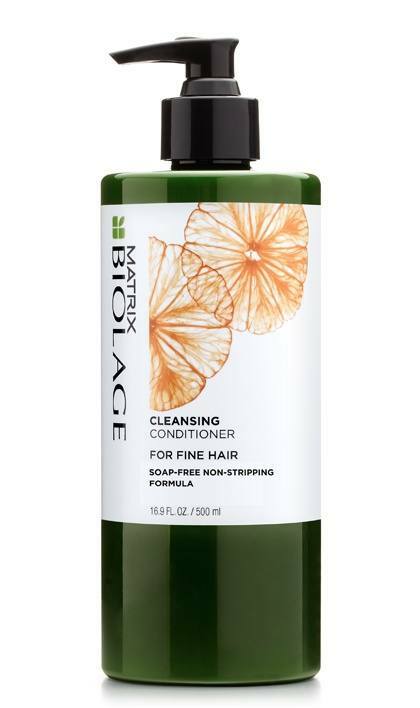 Share https://www.matrix.com/biolage/cleansing-conditioner/cleansing-conditioner-for-fine-hair Cleansing Conditioner for Fine Hairhttps://www.matrix.com/~/media/matrix us media library/2016krakenimages/biolage_cleansingconditioner_cleansingconditionerfinehair_b-cc-fhc.jpg Maintains moisture balance for weightless conditioning. Low-lather Cleansing Conditioner for fine hair with Citrus provides thorough cleansing and lightweight conditioning to enhance shine, suppleness and anti-static control. Suitable for daily use or in between traditional shampooing. Apply to wet hair. Use 6-8 pumps depending on hair length and density. Distribute evenly and gently massage until hair is completely saturated. For best results, leave on for 5 minutes. Rinse thoroughly. Suitable for color-treated hair. Rated 5 out of 5 by JulieRsc from Please bring this back! I finally FINALLY find a product for my hair and now I can't find it locally! Please bring it back. Please! Rated 5 out of 5 by Jeani D from PLEASE BRING THIS BACK!!!! I can't express my disappointment at this being discontinued enough!!! This is the only Matrix or Biolage product I have ever tried and liked well enough to continue purchasing - if this remains discontinued I regret to say you will undoubtedly lose a regular customer. i'm glad I purchased 4 32 oz. bottles at my last purchase, but I will likely run out in a few months. Please, please PLEASE consider bringing this back, or at least a new product that is a one-step cleansing-conditioning product for fine hair. Rated 5 out of 5 by Lulu0901 from Hesitant Buyer So I bought this shampoo as a bundle, two bottles for the price of one at my local grocery story. I didn't realize when I purchased it that it was a cleansing conditioner until I went back to the store to look for the shampoo. When I asked one of the sales people why they only had conditioners that's when she explained the cleansing conditioner to me. I went home and researched the product saw online reviews and Youtube videos on how to use the product because I naturally have VERY oily hair so I was hesitant to try the product in fear that I would end up with oily/greasy hair. I was wrong, I LOVE this product! My hair feels so soft and lively! You have converted me and made me a believer! Keep it up! Rated 5 out of 5 by IberiaMom from GREAT product for graying hair Anyone with graying hair knows the difficulty in keeping it in control. While most women choose to overcome this by using color, this just isn't something I want to do. My daughter gave me a bottle of this shampoo because it didn't work for her. It sat on my bathroom shelf for a long time before I decided to try it to manage the wild gray strands. WOW! the results were amazing. I wash with this product, let my fine hair dry naturally and use a straight iron in the morning. My hair is shiny (NOT OILY), sleek and completely under control. Oh how I wish I had tried it sooner!!! Rated 5 out of 5 by Honeybear12 from ❤️❤️❤️ THIS PRODUCT! PLEASE DON’T DISCONTINUE!!! I have been trying for YEARS to find a product that will not only clean my fine and curly hair, but would actually keep it healthy, improve shine, and decrease bad hair days... THIS IS THE ONE!!! I have never been so thrilled with a product than I have with this one, and it is literally the only thing I use to wash my hair... but now I can’t find it at Ulta, and I’m having a hard time finding it online. Please, on behalf of all fine hair owners (especially fine curly-haired ones) PLEASE DO NOT GET RID OF THIS PRODUCT!!! I will literally cry without this!!! Rated 5 out of 5 by Tone from Totally awesome...! What to say...? I just received this in the mail yesterday, so I tried it this morning. I had to order it from abroad as it was not available in shops here in Norway. I have never used a cleansing conditioner before, (nor any other products from Matrix) and I wanted to try one that is full of nourishments. After reading about them online, I deceided to try this one from Biolage. I took the «Biolage Diagnostic Tool» and was reccomended the one for thin hair. (I was thinking of ordering the one for curly hair). My hair is 2b-2c curly. I have lots of hair so my hair appears thick but my hairdresser sais that each strand is thin. I find that most of the nourishing shampoos/conditioners weigh my hair down and loosens up my curls, and I like to enhance my curls. My hair also has damage from highlighting and I often get a lot of frizz. I didnt order the "leave in conditioner" because of too high shipping cost and import taxes, so I just used my regular «leave in» and styled my hair as usual. But OMG... I was pleasantly surprised and a bit shocked to be honest. My hair is full of body and shine, frizz free and my curls look beautiful and nourished just after using this once! (and the weather is hot and humid here today) It has a mild lemongrass/green tea scent. I will definitely buy again, and will also buy the "leave in" next time. Rated 5 out of 5 by chicago from Please tell me this isn't being discontinued?! I absolutely LOVE this product, please don't take it away! I found the bulk size on deep sale at Ulta and fear it's being phased out. I have intensely fine hair and now hitting menopause, it's also thinning. This is the ONLY product that I use on my incredibly delicate hair. Rated 1 out of 5 by ashbruce from Leaves my hair greasy I purchased this at the salon the other day. I never spend the money on good hair products, but I figured I would give this one a try since I have fine hair and wanted to be nicer to it. The smell is awesome, and my hair feels nice for a a few hours after washing, but within a few hours, my hair turns greasy and stringy. Please let me know if I am doing something wrong. This was a big purchase for me and I would be so upset if the first time I spent the extra money on the good products like this one, that this is the inevitable result. I get my hair wet, apply the cleansing conditioner and wait the 5 minutes suggested before rinsing and it doesn't help. I have tried leaving it on less time, and still the same results. Please help!